COLOR(S): Reddish fawn to mahogany coloring with black shading, principally on muzzle and tail. The Laekenois is one of the four Belgian shepherd dogs, but is not widely recognized outside their homeland. They are the rarest of the Belgian shepherds, and in the U.S. they are the only Belgian shepherd dog not recognized by the AKC. 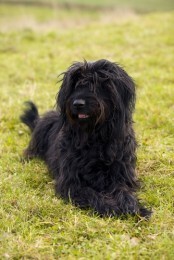 In addition, the four Belgian breeds are only recognized as separate breeds in the U.S. and Belgium; in every other country the four breeds are considered one, with four different variations. Laekenois are identified by their rough and wiry coat, as opposed to the smooth and fluffy coats of their counterparts. They are medium sized dogs, with prick ears and are fawn to mahogany in coloring. Belgian Laekenois are almost identical to the other Belgian Shepherd Dogs, except for their curly coat. They are shaggy looking and sometimes have a black face. The Laekenois is obedient, friendly and loyal to its family. They are good watchdogs and guard dogs as well, but will not attack unless they or one of their own is directly threatened. They are somewhat domineering in attitude, and a potential owner should recognize that they need to begin training early in order to be the "top dog" in the relationship. This breed is said to snap the least out of its cousins, the Groenendael, Tervuren and Malinois. Laekenois are obedient, loyal, and good watch dogs. They will alert their owners of something unusual, and will make good guard dogs if called upon. They will only attack if there is a true threat, however. The Laekenois is agile, versatile and can be dominant to other pets and to its owner. Training early in life is needed. The breed is also sturdy, very trainable, and loves the outdoors, no matter what the weather. Harsh, curly, wiry and dry hair. Daily combing and brushing of the Laekenois' coat is important. Clip out mats that form particularly in the ruff and on the legs. Clip hair from between their toes and on the outer ears. Bathe only when necessary. Shedding is bi-annually. Epilepsy, anesthesia sensitivity, cancer, PRA (Progressive Retinal Atrophy), thyroid problems, excessive shyness, eye problems, and hip and elbow dysplasia. These are a working dog and need a lot of exercise, preferably off the leash as much as possible. Herding games or a job to do are excellent sources of exercise. Early training will prevent puppies from developing a sharp temper. The Laekenois will adapt well to both an urban or country environment as long as they have space to roam. A home with a fenced yard is essential. The best owner for this breed would be an active dog-experienced owner living in a rural or suburban environment.